What does 15 years of NFL quarterbacking experience have to do with the LSAT? More than you’d think! 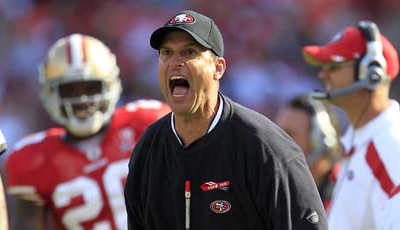 Check out what 49ers coach Jim Harbaugh has to say, and how it relates to you as an LSAT taker! I’ve been a huge San Francisco 49ers fan since I was 5 years old. Naturally, with the Niners returning to the Super Bowl for the first time in almost two decades, I’ve been devouring Niners-related videos like I normally devour ice cream sandwiches (and trust me, it’s not pretty). My friend Vince linked me to this one, of 49ers coach Jim Harbaugh giving a quarterback coaching clinic in San Diego a few years back. Fair warning – if you’re not a football fan, some of the contextual lingo may sound like meaningless jibber-jabber. Conversely, if you’re a San Francisco 49ers or recentish Stanford fan, you’ll probably want to watch the whole thing. But that aside, skip to about the 27 minute mark, and listen to Jim Harbaugh when he begins to talk about the attitude that his quarterbacks must have. I’ve transcribed it below, but it’s really much more powerful when you hear it straight out of Coach Harbaugh’s mouth. The quarterback is the challenged player. He is the challenged player on every single possession, on every single down. The quarterback is the challenged player because he’s going to have the ball in his hands. He’s got to do something with the ball. He’s gotta get it to somebody, he’s got to make a throw, he’s gotta make a conversion – he is the challenged player. Every single down. His attitude: I must win. I must WIN. I must win. Whatever I’m doing – if it’s in practice, if it’s in a game – I must WIN. I must BEAT you. I must WIN. I must find a way to win. I MUST win. If I’m throwing 1-on-1s, I must win. If it’s 3rd down, I must win. Teach these guys no matter what drill you’re in (thanks, coach. I’m sorry, you can take that out of my check), no matter what it is. If he’s just dropping back and throwing on air, taking a five step drop and throwing a curl route to a receiver, he’s gotta visually imagine that it’s 3rd and 6. It’s 3rd and 6 and I’m in a game, and I simulate the snap, I simulate the drop just like I would, I tell myself it’s 3rd and 6 and I must win, I must complete this ball. Don’t ever let a quarterback throw routes on air, or 1-on-1s or anything like that, or practically even catch without thinking that way. You cannot have a guy just take a ball, stare a receiver down, and act like he’s just…throwing the ball, you know? I must win. I gotta picture that it’s 3rd and 6, and I must win. I must beat somebody. Every single practice, every single play. Whatever it takes, I must win. Coach Harbaugh goes into some additional things he wants from his quarterbacks after this, but let’s cut it off here and discuss. First of all, I hope you all enjoyed watching a former NFL quarterback break the overhead projector he was using while giving a seminar because he got a little too excited about what he was saying. For the record, that’s the kind of passion and fire you want out of your teachers. Jim Harbaugh is a great teacher, and this video is proof positive of that. Second of all, whether you know what a curl is, or how bad a 3rd and 6 is, or whatever other lingo confused you, it doesn’t really matter. Not only is it a good exercise in learning to understand things in context, the specifics here are entirely irrelevant. The message behind it all – the attitude that every quarterback must possess – is the key. You are the quarterback here, and you are locked in mortal combat with the LSAT. Your prize for “winning” the “game” is getting into the law school of your dreams, but you must get through the defense first, and that defense doesn’t like you very much. It is out to prove that you don’t belong, and it is perfectly willing to separate your head from the rest of your body to do so. You are the challenged “player” (test-taker) at every point during this “game” (test), and you alone are responsible for doing something on every “possession” (question). 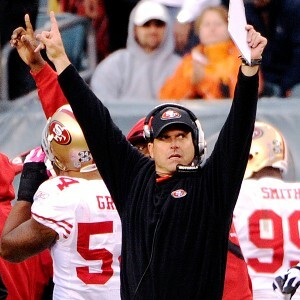 Your attitude must therefore be the same as that of Coach Harbaugh’s quarterbacks. You must never take the easy way out – not even once. That means no fudging the timer so you have an extra minute to bubble your answers, or stopping time while you go to the bathroom. That means no “adjusting” an answer after the fact because you made a stupid mistake or misread the question. That means no counting guesses as correct answers just because you happened to get lucky. That means never doing a ‘throwaway’ problem set or practice test that you’re not taking seriously. There is no time for that kind of nonsense. Every practice test must be taken in full under strict timed conditions, with no corner-cutting allowed. Every problem set must be done with the mindset that you are sitting in the test room on test day. Every question you get wrong is a challenge, an obstacle for you to take down, and you must never allow yourself to gloss over an unclear concept or ignore a mistake you made. During the actual application process, ‘soft’ factors like ethnicity, background, experience, and being a good person all come into play, but the LSAT doesn’t care about any of that. I don’t care how likable you are, I’ve never seen anyone schmooze their way into a good LSAT score. It is the cold, heartless wall between you and your dreams. You must prove that you belong by taking that wall apart, brick by brick. What happens if you don’t adopt this mindset? If you start allowing yourself extra time to bubble at the end of a section, or giving yourself scratch paper to work on, or discounting a particular test score because your cousin’s sister’s 3-year-old daughter walked into the room in the middle of section 3 and began bawling her eyes out? Well, that’s how people delude themselves into thinking that they’re doing better than they actually are. That’s how people end up with huge drops in performance from practice test to real test. Every deviation makes it easier for another deviation to occur, and is a complete waste of valuable prep material to boot. It’s like going to class – cutting class one time makes it easier not to go the next time as well. You cannot fall prey to that. You must draw a line in the sand that you will never cross. No excuses. No rationalizations when things don’t go your way. Every failure must be seen as a springboard to future success, because there is no other way to reach your goal (we’ll discuss this in more detail in a future post). Swallow your pride, face the truth, take your lumps, and learn the lessons that go with them. When you do things the right way, you will be rewarded in the end. Every single practice session, every single question. Whatever it takes – I must win.